A trademark or service mark is for any word, phrase, logo, or design that identifies the source of particular goods or services. Under United States common law, a mark is considered a trademark once it is in actual use. 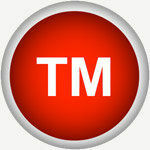 All trademarks and service marks identify and distinguish one's goods or services from other's. Trademark law is complex, requiring extensive knowledge of procedures in order for trademark registration to properly and legally occur. We strongly recommend businesses use a trademark attorney to avoid trademark infringement and for trademark registration. Anyone who claims rights in a mark should use the symbols TM (trademark for goods) and SM (service mark for services) to alert the public to their claim to an unregistered mark. The owner does not have to have a trademark application filed or a registered trademark to use these symbols. The registration symbol ® ("R" with a circle around it) may only be used when the mark is actually federally registered with the USPTO. This applies to both registered trademarks and service marks. Generic trademarks are not registrable since they describe the whole class of goods, such as the word "spoon". Arbitrary marks are the best choice when selecting a trademark since they have absolutely no meaning associated with the owner's product or service, such as "3M". A trademark search should be completed for determining whether your proposed trademark is eligible for use and federal registration. For words or logos, a search should be conducted of federal records maintained by the USPTO. A State trademark and Common Law search should also be completed since rights in trademarks vest initially with the first to use the trademark in commerce. Common Law trademarks are marks that have not been federally or state registered, but are used in commerce by another company. A use-based application is utilized when the applicant is using the mark in interstate commerce. An intent-to-use application is used when the applicant has not used the mark in interstate commerce but intends to use the mark and wants to reserve it for use in the future. When an individual or organization transacts business under a name different that its true name, the name is considered a "trade name". The trade name should be registered with the Secretary of State where the business is organized. One benefit of having a trade name is that no other organization can transact business under the same or deceptively similar name to the registered trade name. A trade name can also be used to prevent another organization from registering a similar State trademark. Contact our trademark law firm at (202) 455-5294 to help with trademark registration, or if you feel you have been a victim of trademark infringement. Palo Alto CA, and Washington DC. You can contact us at (510) 655-9111 or (202) 455-5294.